Mold remediation is not a process that can be done with cookie-cutter methodology. Each mold remediation project needs to be assessed by an experienced, professional mold remediator to determine which level and method of removal and remediation works best for each given situation. Just as with mold testing, there are no industry standards that designate one single “right” way to remediate a structure, which makes selecting an experienced, reputable mold remediator critically important. For this reason, we have prepared the following mold remediator tips and designed support material to get you up and running quickly—knowledgeable in industry terms and industry—to aid you in the process of interviewing mold remediators. Now that you know the quickest route to gathering vital information, let’s take a look at what mold remediators actually do and how you can best prepare yourself to identify an experienced mold remediator. What is the job of the Mold Remediator? The mold remediator is responsible for carrying out the written mold remediation protocol when provided by the mold assessor. He is also the mold assessor’s backup man on the lookout for any hidden structural mold or sources of water intrusion or moisture buildup, so selecting a qualified and experienced remediator is imperative. Provides a detailed, written mold remediation work plan outlining the specific steps that will be taken, the equipment that will be used, the size of the crew, and the number of man hours needed to complete the project. When applicable, the mold remediator will use the mold remediation protocol provided by the mold assessor as general guidance. 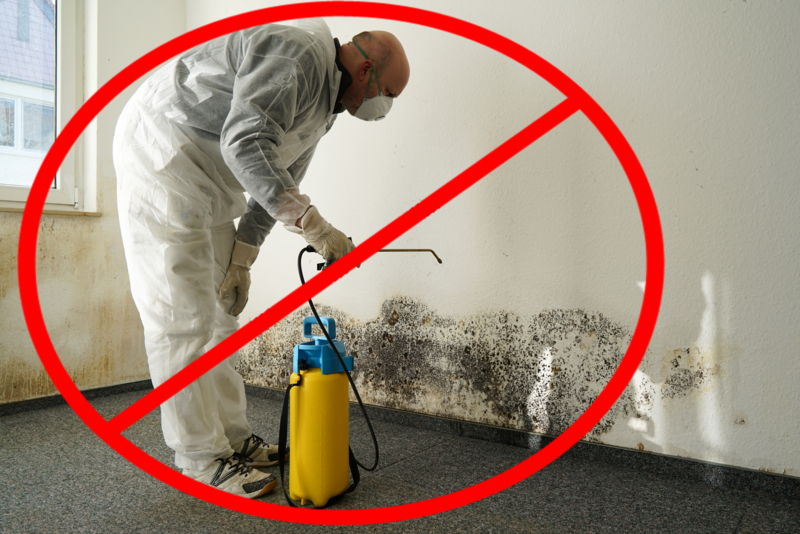 The protocol may recommend removal methodologies but ultimately the method of removal is up to the mold remediator. Creates containment of area in occupied space that is mold-contaminated before beginning removal or remediation processes, so the rest of the structure does not become contaminated. Levels of containment created can range from limited containment to isolated containment, the highest level of containment used for occupants environmentally sensitive or in high-risk groups. Uses air filtration devices (AFD) as air scrubbers and negative air machines, as needed. Air scrubbers clean and recirculate the air inside the structure. Negative air machines circulate air through machines with attached ducting that exhaust to the outside. Finds and fixes moisture sources, including coordinating work with other tradesmen, such as plumbers, roofers, electricians, painters, etc., as needed. Performs mold remediation services according to industry standards, including 1) removal of personal property and mold-contaminated building materials deemed not salvageable, 2) sanitation and cleaning of salvageable personal property, and 3) mechanical cleaning of salvageable building materials. Effectively supervises trained/certified mold remediation workers (MRW) performing mold remediation tasks onsite. Assesses and interprets results of tasks performed in work plan. Coordinates post remediation verification (PRV) with the initial mold assessor or PRV professional. Performs any additional work required to meet PRV criteria designated in mold assessor’s protocol. Having a water leak or flooding incident in your home or workplace is stressful. Finding out you already have structural mold in your home or workplace can be even more stressful. Don’t let the shock of it all panic you into making rash or ill-informed decisions. Moving too quickly can result in an outcome far worse than the initial water leak or resultant structural mold. Worse yet, by the time you realize you have made a less-than-optimal decision regarding your selection of a “professional” mold remediator, it is often too late to undo what has been done or recoup the money that has been spent without costly litigation, the outcome of which can be uncertain. Mold remediation of a structure involves removal and mechanical cleaning of mold-contaminated structural materials. This process inherently causes levels of mold, bacteria, dust, and debris to concentrate in the indoor air. To prevent these elevated levels of airborne contaminants from spreading through to the rest of the structure, creating temporary barriers to contain the mold-contaminated portion of the occupied space is standard practice in the industry. Properly created containment barriers are designed to enable occupants to remain living and working in the non-affected portion of the structure. However, even with containment in place, it may be advisable, especially for people environmentally sensitive or in a high-risk group, to not remain living or working in the structure during the tear-out and cleaning phase of remediation. To learn more about high-risk groups, read our brochure Disaster Area Residents. Do You Even Need a Mold Remediator? When a leak or water intrusion has just occurred, or it is still within the first 48 hours of the initial incident, nonhigh-risk property owners may be okay jumping in and tearing out the wet building materials, depending on their skillset. Do you have the necessary tools to perform the tear-out? Do you know how to turn off any necessary utilities, such as power or water? Do you know how to cut into a wall without harming other building components such as electrical wiring or plumbing? Do you know which building materials must be discarded and which may be salvageable? Do you have a way to discard of the debris? What about any contaminated debris? Do you know how to clean and, if necessary, sanitize building materials? Do you have the necessary amount of proper equipment, such as fans, heaters, and dehumidifiers, to dry out the structure after the tear-out phase? Do you have the expertise to identify the source of water? By not calling a remediator, you may save both time and money, but do realize that professional mold remediators carry insurance, which makes you eligible for coverage under the limits of the policy should a problem arise due to the services provided by the remediator. Mold remediators carry general liability insurance with a pollution control clause. Should you decide to forego hiring a mold remediator and do it yourself, it may be advisable to contact a mold assessor once you have completed the tear-out and cleaning/sanitation phase (unless the size of the project was very small, such as 3 ft. x 3 ft.). At this point, the mold assessor would perform an initial assessment and let you know if air quality testing was advisable. To be able to spot a mold remediator who knows—or doesn’t know—his trade, become knowledgeable on the mold basics, testing methods, terminology, and common mold scams. That way when you are interviewing a mold remediator and he gives an incorrect answer, you will know to move onto the next prospect on your list. Preparing yourself in this manner can help ensure a successful remediation, saving you untold amounts of money and potentially years of health problems. Researching this type of information can be time consuming, which is why we did the research for you and compiled it in Section I of MOLD: The War Within, a book we wrote after recovery from mold-related illnesses after Hurricane Katrina. The book contains a foreword by Dr. Doris Rapp, a renowned pioneer in the field of environmental medicine. It also has received accolades from other medical professionals, including Dr. Joseph Mercola who describes the book as “one excellent resource”. For immediate access to this comprehensive source of information, download a copy here. Learning mold lingo can be confusing. It can be like learning a foreign language. To help simplify the process and shorten the learning curve, download our Mold Remediator Section Form to use as a guide when researching mold remediators. We custom designed the form in a way that would make it easier to compare companies, using four stages of information gathering and criteria screening. The form is a simple and effective support tool to help you make an informed decision. By using our Mold Remediator Selection Form, you will remember to ask all the appropriate questions and have an organized way to keep track of answers. The next step is to understand each area of the form and how it may apply to your situation. For the Explanations of Criteria Used in the Mold Remediator Selection Form, click here. A good place to start when trying to locate a certified mold remediator in your area is to run a search for mold remediators using your zip code on our Mold Remediator Locator Map that contains certified mold professionals. Be aware that there is a difference between a mold remediator and a mold remediation worker (MRW). The two main differences are as follows: 1) a mold remediator has undergone a higher level of training than an MRW, and 2) a mold remediator oversees the execution of the detailed mold remediation work plan whereas an MRW performs the remediation work itself without the project management responsibilities. Depending on the size of the company, the mold remediator may or may not perform actual remediation tasks. In larger companies, the mold remediator may manage the project and supervise a crew of MRWs. In smaller companies, the mold remediator may manage the project and perform the actual remediation work. Additional information on structural mold and testing methods is available in the first three chapters of Section I of our book, MOLD: The War Within. The book addresses structural mold, the health effects of mold exposure, and treatment options for mold-related illnesses. It includes firsthand interviews with experts in indoor air quality, mold assessment and remediation, and building science as well as documentation from published, peer-reviewed journals. We give special thanks to our industry reviewers: Jim Pearson, CMH, and Doug Hoffman, CEO of National Organization of Remediators and Mold Assessors (NORMI). Their pre-press reviews of the Mold Remediator Selection Form ensured the accuracy and user friendliness of the form. Jim Pearson, CMH: Mr. Pearson has over 35 years of experience in indoor air quality and is president and CEO of Americlean, a full-service restoration company in Billings, Montana. For the past 13 years, Mr. Pearson has acted as the Chairman of the Consensus Body in charge of writing and publishing the ANSI/IICRC S520 Standard and Reference Guide for Professional Mold Remediation. Doug Hoffman, CEO of NORMI: Mr. Hoffman has over 35 years of experience in the construction field as a state of Florida certified class “A” general contractor, a certified master plumbing contractor and a certified master roofing contractor. Since 2004, Mr. Hoffman has been the head of NORMI. As an approved training provider for the Environmental Protection Agency (EPA) and multiple states, NORMI provides training to members and issues over 14 certifications that meet licensing laws now established in Florida, Louisiana, Maryland, New York, Texas, and Washington, DC. NORMI is active in the promotion of mold legislation in non-regulated states to provide residents with a higher level of consumer protection.